"Google Rich Snippets" CS-Cart add-on is specially developed script for this eCommerce platform. This module displays attractive Rich Snippets for product details pages and regular pages in SERPs. Rich Snippets - detailed information that is displayed under every Google search result. It allows users to define if the page meets their search query or not because they see such useful information as the price, rating, etc. Since goods are displayed in an appealing way in search results, it may result in more clicks to your pages. It has a great SEO effect that can bring more profit to an online store. product price and status "In stock" or "Out of stock" make potential customers to click on the link in SERPs and visit the store. Product rating shows that the popularity of the item or the content. This module uses structured data schema.org markup which is used by the major search engines (Google, Yahoo, Bing). Ability to enable/disable the above options except for the price. Please, install and enable "Comments and Reviews" module if you want to show rating and the number of reviews in a Rich Snippet for your goods. Stars in SERPs depend on trustful reviews! This extension works correctly in Internet Explorer, Mozilla Firefox, Safari, Google Chrome and Opera latest browser versions. The add-on is compatible with CS-Cart 2.1.x and 2.2.x versions, CS-Cart 3.0.x. 1. This CS-Cart module uses the standard template of a product details page. If you use a modified skin, please, choose the Installation for modified CS-Cart option to guarantee the correct module functioning. 2. After the installation of the addon, you can test it using Rich Snippets Testing Tool. 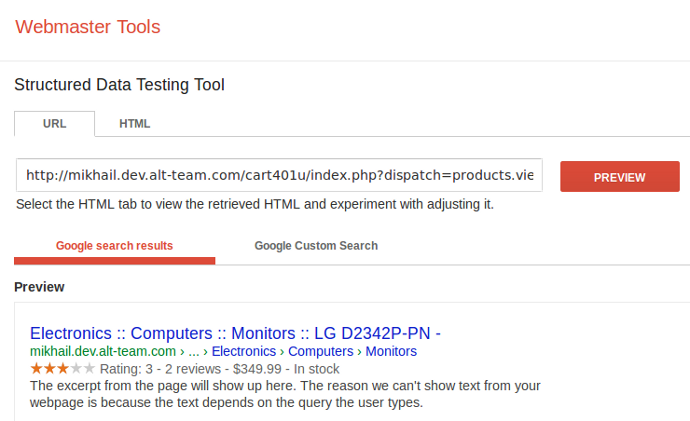 Google does not guarantee that Rich Snippets will be displayed as you expect in Google search results even if structured data is marked up and can be extracted successfully according to the Rich Snippets Testing tool. that is why the addon can be incompatible with other extensions which use the same hook. Thus, if you have third-party modules installed which use this hook, choose the Installation of a modified CS-Cart option to guarantee the correct plugin functioning. 4. Important for users of Alt-team "Product designer" add-on. If you use our CS-Cart "Product designer" module, Rich Snippets will be displayed in SERPs only for those item details pages where this module is not enabled. For the present moment, all details pages with the enabled Product Designer tool cannot use "Google Rich Snippets" markup. 5. After the payment is confirmed, you will be able to download the module's files from the order details page. Remember that we can make any changes in this add-on due to your demands. Please, feel free to contact us if you have any questions about this add-on. 1. Download the archive with the Google Rich Snippets add-on. 2. Make a backup of your "[CS-Cart root dir]/skins/[current_skin_dir]/customer/common_templates/breadcrumbs.tpl" file. 3. Unpack the "addons" and "var" folders and upload files to your server in the root directory with the installed CS-Cart. 4. Unpack the "skin" folder and upload the "[Unpacked dir]/skins/basic/customer/common_templates/breadcrumbs.tpl" file to your server in the "[CS-Cart root dir]/skins/[current_skin_dir]/customer/common_templates/" directory with the installed CS-Cart. 5. Log into the administration panel of your store, go to the Administration -> Add-ons page. 6. In the list of add-ons find the Google Rich Snippets add-on and click Install opposite to its name. 4. 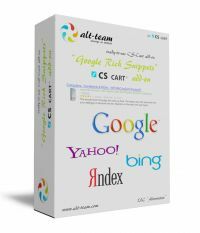 In the list of add-ons find the Alt-team: Google Rich Snippets add-on and click Install opposite to its name. Thanks for your review! We really appreciate it." "This add-on is great. Alt-team implemented and in one day many pages was indexed, with stars, in Google. Google is encouraging the use of STRUCTURED DATA and implementing it is a great competitive advantage. "Hello Nick and thanks for your rating! The add-on doesn't influence the standard images functionality. Also, notice, Google doesn't display the product image in the search results (it is just how Google works with the product mark-up). Yes, this add-on uses the view_main_info hook (only this hook, no more other changes), so there may be an incompatibility issue with other add-ons using the same hook. Also, if you have a modified skin for your pages, some adjustments may be required because the add-on works with the default CS-Cart template. " "Does this plugin also adds Image Prop? Also, except the changes in the view_main_info hooks, does it have other changes? "Work amazing. It is showing all things which was promise. And get visible just in one week. Big thanks to alt team. 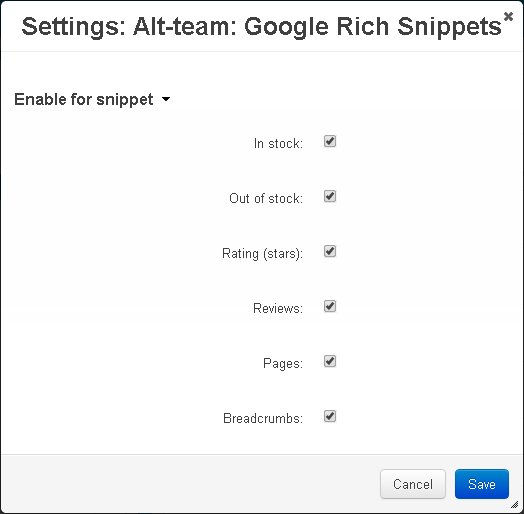 :) "
"The rich snippets add-on is excellent, very easy to install, it did need some customising to work with other add ons but the Alt Team dealt with it superbly. Wouldn't hesitate to recommend them. First class product first class service." "This addon is very interesting, but the price for Ultimate is simply way to high. $250!! I have purchased dozens of addons from you and will buy many more, but this price is just not realistic. See the discussion on the CS-Cart forum for more opinions about this pricing." "The Google Rich Snippets add-on worked just perfectly! A few days after I activated it, Google changed it's snippet on every product just as I wanted it." "Great add-on, perfect stuff, super fast support. Alt-team number one." "Dear Octav! Someone played with the demo, that's why it wasn't working. We've restored it, now all links are active."